For more information about pole barns, post frame buildings, and other custom building packages, contact us today, or visit your local store. 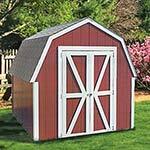 Our most popular pole barn package. 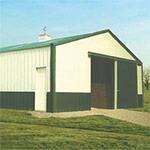 This sturdy pole barn is the answer to most storage needs. It features square pressure-treated posts, treated splash board, easy-to-build trusses, continuous interior space, heavy duty sliding door track and hardware, standard 10' side walls (other wall heights available) in a variety of colors, steel insulated walk door, skylight panels, plans and much more! 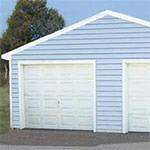 For building designs with overhead doors, see our Post Frame Garages. Metal pole barns hold up significantly better against destruction from harsh weather, erosion from termites, and damage from water or condensation. 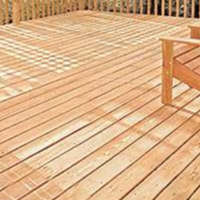 They last longer and offer better protection for the valuables kept inside. For more information about deluxe post frame buildings, pole barns, post frame garages, and other custom building packages, contact us today, or visit your local store. Sutherlands® Credit - Get started on your Building now! 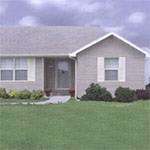 The Sutherlands.com store does not offer custom building packages. 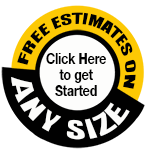 Please choose another store to request a estimate. PLEASE NOTE: This video is intended for general information. The actual material list, building features and construction methods vary by store, and may be different than shown in the video. Please ask our salesperson for details.